She reminisces about picking blueberries as a child in Maine in August and remembers reading Robert McCloskey’s, (the author of the famous children’s book Make Way for Ducklings) Blueberries for Sal all winter long. She fondly recalls canoeing out to Blueberry Island with old Folgers Coffee cans to collect wild blueberries, and talks about how beautiful the blueberry bush, cousin to the azalea and rhododendron, is with its red foliage in the fall. And she also mentions the incredible health benefits that blueberries have long been touted to have. “Sweet, low in sugar, and highest in antioxidant levels of all fruits and vegetables,” blueberries, nicknamed the little blue dynamos in 2010, are referred to as a miracle fruit. They are thought to have preventative properties for diseases such as Alzheimer’s and Parkinson’s, and are rich in fiber, high in vitamin C and manganese. Below please find a sampling of her recipes that we will be busy experimenting with over the next few days. In the meantime, try the very easy and delicious blueberry peach cobbler, a favorite summer evening dessert that we have made time and again. In 11″ x 8″ glass baking dish, melt 2 tbsp. of butter and stir in 1 tbsp. brown sugar. Add 3 medium-sized sliced peaches (cut into bite size pieces) and 2 & 1/2 cups of local farm fresh blueberries. Stir gently in baking dish to thoroughly coat fruit pieces in butter/sugar mixture and then spread evenly on bottom of dish. In a medium-sized bowl, mix the flour, brown sugar, granulated sugar, baking powder, and cinnamon. Beat the egg lightly and stir into the sugar mixture (after adding the egg, I used my hands to better mix the crumble mixture evenly). Spoon the mixture on top of the blueberries and peaches. Melt the butter in pan and drizzle overthe batter. Bake for 30 minutes or so (until nicely and lightly browned) in 350 degree F oven. Let slightly cool before serving with your favorite vanilla ice cream. Note: the cobbler topping for this dish is from Olwen Woodier’s Apple Cookbook, a revised edition of an award-winning cookbook when first published in 1984. Every recipe I have ever tried in this book has turned out superbly and so when looking for a blueberry cobbler recipe I decided to use their apple cobbler recipe substituting peaches and blueberries for the apples. *A cobbler differs from a crisp in that the cobbler has a biscuit/cake/cookie-like batter that is dropped on top of the fresh fruit in small rounds giving it the appearance of a cobbled road. A “crisp” is made with a streusel-like topping that always contains oats which “crisp” up when baked. A “crumble” is very similar to a crisp however does not use oats. The names “crumble” and “crisp” originated from England and as time has gone by the lines between these two names have blurred and are now used interchangeably. Note: this jam tastes like it took hours to make, but it goes from pan to jar in under 30 minutes. Double the recipe so you can save some for dark winter mornings, a reminder that summer will be back. Combine all of the ingredients in a saucepan and bring to a boil over medium-high heat. Continue to boil, stirring occasionally, for 12 minutes, or until the mixture begins to gel. To test the consistency, chill a small plate in the freezer for 15 minutes. Remove the plate from the freezer and drop small amounts of the jam onto it. The jam is ready when it holds its shape instead of pooling out over the plate. Transfer to clean jars with tightly fitting lids and refrigerate for 30 days. Note: Sterilizing and sealing the jars keeps jam fresh for up to a year. Those who plan to keep the jam for an extended period should sterilize a jar and its lid by using a pair of tongs to submerge them in boiling water for at least 10 minutes. Alternatively, place the jar, lid, and metal soup spoon in the oven at 250 degrees F for 25 minutes. Remove from the oven and, wearing oven mitts, use the sterile spoon to scoop the jam from the pan and into the jars. Still using mitts, tightly screw on the lid, and set aside to cool. The hot air between the jam and the lid contracts as it cools, sealing the lid tight. The jam is now safely stored at room temperature. Once the jar is open, place the jam in the refrigerator and use within 30 days. Makes about 1 ½ cups. Note: Use this vinegar in a dressing for an arugula or spinach salad, or as a marinade, glaze, or reduction for pork, ham, or duck. The beautiful plum color makes it an ideal gift item. Add fresh blueberries for decorative purposes. Combine the honey and vinegar in a small, nonreactive saucepan and bring to a boil over high heat. Place the mint and blueberries in a glass bowl and pour the honey and vinegar mixture over them. Cover and let sit at room temperature for 2 days. Pass through a fine-mesh strainer and discard the solids. Cover tightly and store in the refrigerator. The vinegar is best when used within 30 days. Makes one cup. Note: Perfect for a light lunch, this tart goes well with a green salad or as part of a larger buffet. Make the tarts a day ahead, cover in plastic wrap, and store in the fridge. Always bring them to room temperature before serving. To make the crust, roast the walnuts in a sauté pan over medium-low heat. Stir often until they begin to color and become aromatic. Remove from the pan and set aside to cool. Place the flour, sugar, salt, thyme, pepper, baking powder, and roasted walnuts in the bowl of a food processor fitting with the metal blade and pulse to combine. Add the butter and pulse until the mixture resembles course crumbs. Place the egg and lemon juice in a small bowl and whisk to combine. Add to the flour mixture in a steady stream while pulsing. Pulse until just combined and a ball of dough forms. Coat a 10-inch tart pan with vegetable-oil cooking spray. Sprinkle the dough lightly with flour. With floured hands, press the dough into the pan. Refrigerate the crust for 45 to 60 minutes. Preheat the oven to 375 degrees F. Prick the crust all over with a fork. Bake for about 15 minutes, or until lightly browned. Remove from the oven and decrease the oven temperature to 325 degrees F. Allow the crust to cool. To make the filling, heat the oil in a heavy saucepan over medium-high heat. Add the onions and cook, stirring frequently, for 20 to 30 minutes, until they are deep brown and reduced in volume by at least two-thirds. Transfer to a bowl and allow to cool. Place the onions, goat cheese, cream cheese, thyme, pepper, and salt in the bowl of the food processor fitted with the metal blade and pulse to combine. When smooth, add the eggs and heavy cream, and pulse just to mix well. Place the berries evenly over the crust and cover with the filling mixture. Sprinkle the chives over the top. Place in the oven and bake for 25 to 30 minutes, until the surface is slightly brown and the filling is completely set. Remove from the oven and allow to cool on a cooling rack. Serve warm or at room temperature. Serves 10 to 12. 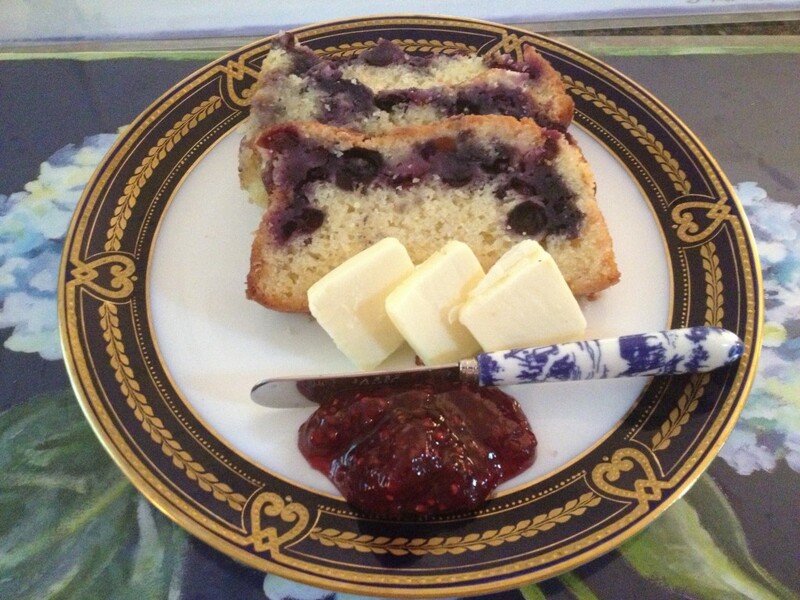 See also the recipes for lemon blueberry bread and blueberry cheesecake (both pictured below).